The low, spreading growth habit of these fleshy-leafed, low maintenance plants makes them ideal as a groundcover for sunny banks, rockery pockets and between paving, where they will quickly spread a carpet of brightly coloured, single or double rose-like flowers. ‘Tequila’ has double blooms and ‘Sundial’ semi-double and double flowers. ‘Margarita Series’ comes with delectable names of apricot, banana, coconut, orange and strawberry, and ‘Cinderella Series’ has yellow and hot pink blooms with a trailing habit, making them ideal for hanging baskets and trailing over pots. 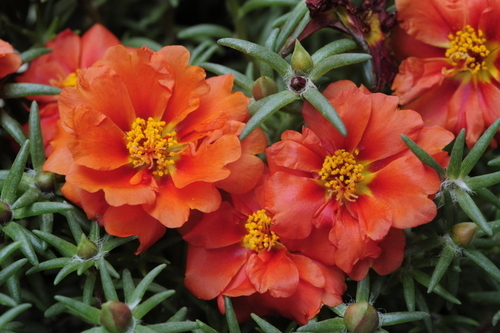 Portulaca are drought tolerant once established, and need full sun in order for the flowers to open. In some parts of the world Portulaca is aptly named the “Time flower” because the flower opens and closes at specific times of the day. You can set your clock to it. Clever little thing! 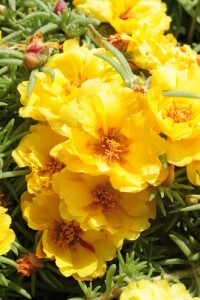 Portulaca grandiflora is part of the Portulacaceae family and is native to the hot, dry plains of northern Argentina, Uruguay and the southern Brazil. It has now been naturalised in other parts of the world. 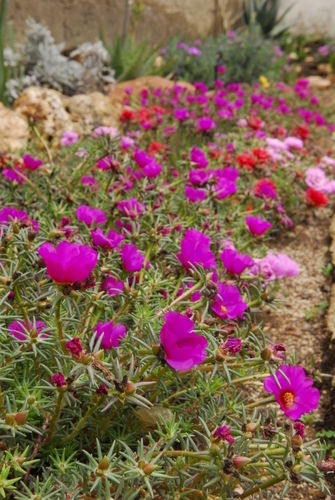 Portulacas are one of very few annual succulents. They love it hot and they are drought tolerant. They will flower from summer up until the first frost. Portulacas mature at around 15cm in height and 30-40cm in width, variety dependent. The reddish coloured stems are prostate or slightly ascending. The green cylindrical leaves are arranged in clusters around the stem. They are pointed at the ends. Both the stems and leaves are thick, fleshy and juicy. The flowers are formed at the tips of the stems. They are rose-like in appearance and have either single, semi-double or double petals. The flower size ranges from 3-5cm in diameter. The colours tend to be bright such as scarlet, orange, yellow, pink and white although there are some cultivars that have been bred to have a more pastel palette. For the most part, the flowers are pure coloured, however there are some that have stripes or spots on their petals. 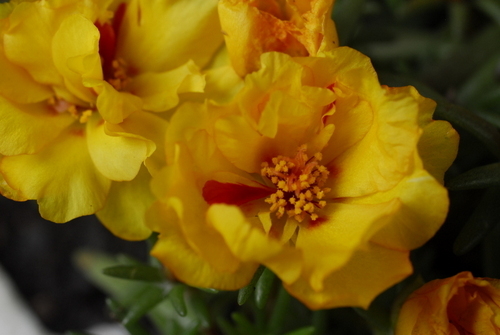 Light intensity is very important and Portulaca flowers will not open on cloudy or rainy days. The best uses for this plant is in a rockery, between stepping stones as groundcover or in a hanging basket. The trailing habit of this plant makes for an ideal companion in containers as it will spill over the edges and add dimension and depth to the overall appearance. Portulacas do not require a particularly nutrient-rich soil. They grow easily in sandy soils with little water and almost no attention. The only important requirement for this hardy little plant is full sun. The flowers will only open in bright sunlight. They will not perform well in shade or waterlogged soil. They do not like too much water and due to the delicate nature of their petals hard overhead watering will cause damage to the flowers. There are not too may pests that are attracted to Portulaca, but you may find aphids and nematodes can cause damage if left unchecked. Companion plant Portulacas with Marigolds, as they enjoy similar planting conditions and repel nematodes and unsavoury visitors! Bees are crazy for Portulaca flowers. However, an hour after pollination the flower dies.